TALENT is the key to success in today's rapidly changing media landscape, said Lee Boon Yang, chairman of Singapore Press Holdings (SPH), yesterday. For the media company, the availability of digital alternatives to its newspapers and magazines and the need for it to be nimble about keeping abreast of such changes and to move into promising growth areas have made it lean heavily on its people. 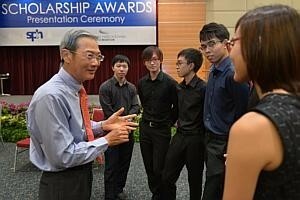 Dr Lee, speaking at the joint SPH and SPH Foundation scholarship awards ceremony, said: "Talent will remain at the heart of our strategy. In order to meet these challenges, we need the best within our ranks to come up with creative solutions and to undertake new initiatives." Altogether, 31 scholarships were given out. With the advent of digital alternatives, media consumption habits have changed, and SPH has "aggressively transformed" itself to reach customers across new platforms, said Dr Lee, citing this year's setting up of the digital division, which aims to be a one-stop solution for both advertisers and readers. SPH has also worked to take its papers online; all its news products are already available in print and digital formats. The company also runs more than 100 magazine titles in the Asia-Pacific, and joint-venture classified sites in Malaysia and Vietnam. Exhibitions and conferences remain a growth area for SPH, which holds more than 30 exhibitions and conferences across South-east Asia each year, and it continues to do well in the property sector, with The Seletar Mall slated to open at end of this year. Of the scholarships awarded, seven were journalism scholarships. SPH will fund the university education of the scholarship recipients, who will serve a four to six-year bonds after graduation. Ten were bond-free Lim Kim San Memorial scholarships, which supports the language and humanities education at local universities for those from modest family backgrounds. The remaining scholarships went to the children of SPH staff and newspaper vendors, funding their studies in junior college, polytechnic and university.